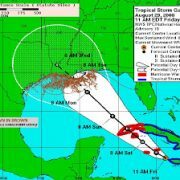 Uh Oh – Here Comes Gustav?! 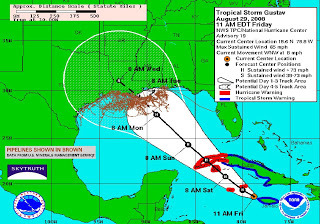 Hopefully not, but exactly three years ago today, Hurricane Katrina made landfall after buzzing through the offshore oilfields in the Gulf of Mexico as a Category 5 storm (we documented some of the resulting offshore oil spills), and now it looks like Hurricane Gustav may be heading for the same trajectory. It just regained hurricane strength today, and forecasters have been predicting at least a Category 3 storm when it reaches the hot water of the central Gulf of Mexico. We’re also hopeful that the mooring systems for floating drill rigs have been significantly strengthened. 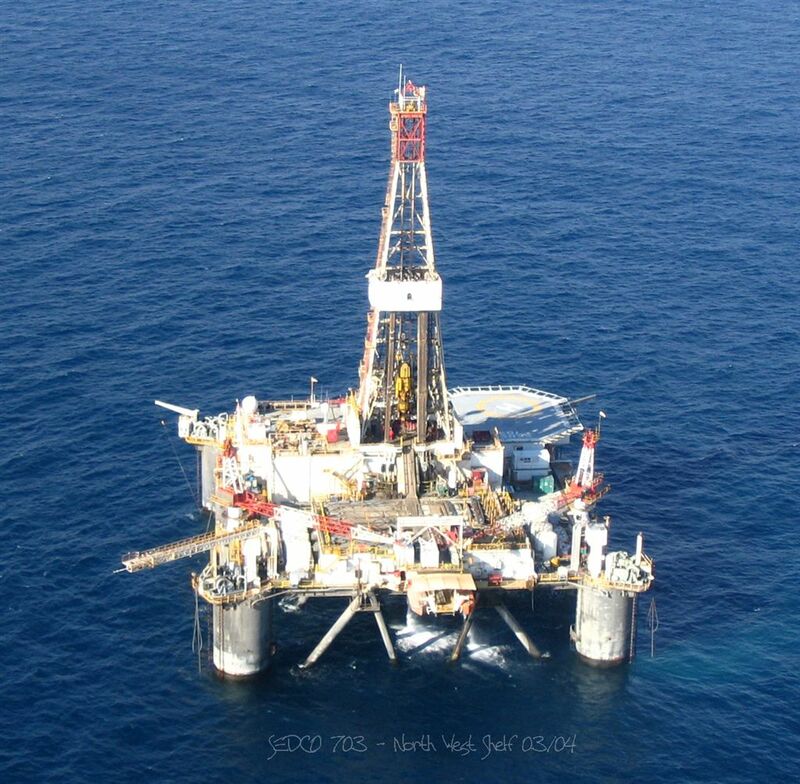 During Katrina, some of these huge rigs broke loose and got blown around the Gulf, dragging their anchors across the seafloor and tearing up the pipeline network. We think that caused many of the offshore slicks we observed on satellite imagery. https://skytruth.org/wp-content/uploads/2008/08/SkyTruth-gustav-5day-29aug08-pipelines-sm.jpg 224 320 John Amos /wp-content/uploads/2016/08/test_logo.png John Amos2008-08-29 19:54:002019-03-06 09:50:22Uh Oh - Here Comes Gustav?! 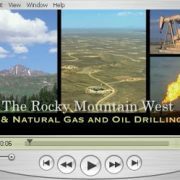 For The Wilderness Society, SkyTruth produced a 3-1/2 minute narrated video showing the extent of drilling across the Rocky Mountain states, featuring a time-lapse animation of the drilling history of Wyoming. You can access the video at the Better Energy website, view it on YouTube, or for a higher-quality experience, watch it at EmPivot, the green-video site. Many groups provided us with photos and other assistance; there’s a full page of credits on the Better Energy web page. Ecofusion provided much technical and creative horsepower (they also worked on our virtual tour video of drilling impacts in Wyoming’s Upper Green River Valley). 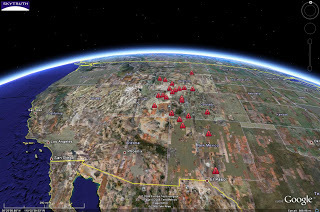 We generated the Wyoming drilling animation and the full Rockies flyover sequences using Google Earth. So of course we’ve also created a Google Earth KMZ file for each state, with all of the well data (nearly 300,000 wells). 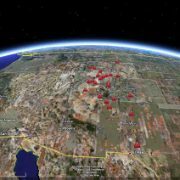 If you’d like to check out the wells nearest you, get Google Earth and download the files for Colorado, Montana, New Mexico, Utah, and Wyoming. The Wyoming well data are animated so you can watch the drilling history of the entire state unfold right onscreen; be sure to click on and read the Viewing Tips to learn how to use the animation feature. 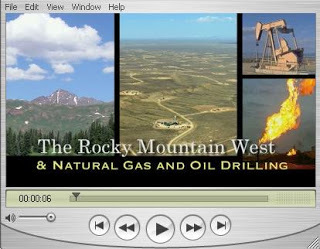 Enjoy the flick, Drilling Gone Wrong: The Rockies on the Brink. Then cruise around our interactive map showing some of the areas in the West where drilling is causing conflicts.